Resources for language teaching: More marketing garbage, now from the tobacco industry! More marketing garbage, now from the tobacco industry! I recently received an email from "Alexa Gunn" (alexa.gunn@student-email.org; not her real name, I'm sure), telling me that I had broken links on my pages (which is true; between migrating the site and organizing my Google Drive, almost every link for my own materials is broken right now). When I asked which links she was interested in, she gave me the link to this blog, which happens to be working just fine. And then she asked me to post links to two organizations that she had volunteered with. The American Lung Association is concerned about the potential health consequences of electronic cigarettes (e-cigarettes), as well as the unproven claims that they can be used to help smokers quit. Presently there is no government oversight of these products. Absent Food and Drug Administration (FDA) regulation, there is no way for the public health and medical community or consumers to know what chemicals are contained in e-cigarettes (also known as electronic nicotine delivery systems or ENDS) or what the short- and long-term health implications might be. The American Lung Association is troubled about unproven claims that e-cigarettes can be used to help smokers quit. The FDA's Center for Drug Evaluation and Research has not approved any e-cigarette as a safe and effective method to help smokers quit. When smokers are ready to quit, they should call 1-800-QUIT-NOW or talk with their doctors about using one of the seven FDA-approved medications proven to be safe and effective in helping smokers quit. The takeaway: this marketing tactic asked me to link to both a legitimate site, and a fake smoking cessation site, probably hoping that I would assume that the unknown one was legitimate since they asked me to link to a reputable site (and apparently hoping that I wouldn't notice that neither one had anything to do with learning languages). So, "Alexa", marketing firm, and e-cig industry, here's my own message: If you want to quit smoking, find resources at the American Lung Association. Changing one bad habit for a different one doesn't benefit you AT ALL, and the e-cig industry right now is entirely unregulated, meaning that there are no controls over what goes in e-cigs, or oversight to ensure that the actual ingredients match the description you've been given. Thanks to all that are updating the comments with names & email addresses! That makes it easier for others to find in a Google search when they're trying to find out more info about the junk marketers. I received another one this week from Amy Creighton (a.creighton@scholaremail.org) from the domain scholaremail.org. I replied to see what the product was, and sure enough, it is also e-cigarettes. As always, all links have been deleted to avoid generating traffic for these sites. Thanks for reporting on this. My school just got one of these too. my cat blog just got this too..
here is a new variation on the theme, and quite persistent as well:- jenna.potter@student-email.org sends follow ups if you ignore. Thank you, Tails from the Foster Kittens & Anonymous, for following up! Jenna/Alexa/whatever other names you & colleagues happen to go by, if the email is the same as the one I received, only one of those sites is a non-profit. The other one is a thinly veiled ad for the e-cig industry. And you are not a random person spreading information; you are a marketer paid to get people to post these links to improve search rankings for your clients. I stopped accepting link suggestions for my page because of marketers like you that annoy me with requests to post junk links. Would you be the person in charge of the external links listed on your resource page? I found a few on the page that didn't seem to be working. I can send the links to you or to whoever manages the page. Thank you for sharing! It's very helpful to share the fake names and email addresses they use so that others who receive these messages can find this info if they Google the name or email domain. Thank you for adding more names to the list! I received one from Jennifer Drake today. Thanks for your information - I'm just adding to your list. Just received the same email from a.creighton@scholaremail.org. Figured something was up and when I Googled that email address this was the *only* link that came up. Thanks!! 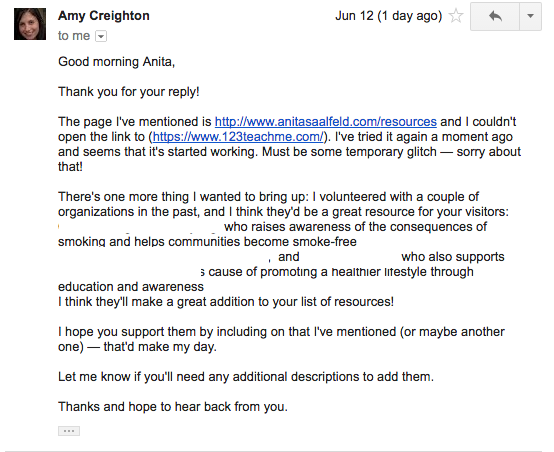 Just got the Amy Creighton email. Thanks for your info. I shall flag it spam and carry on! Thank you for sharing! I'm glad this post is helpful! I had something similar from Sarah Fowler . "Recently I was on your website's resources page and thought they were really useful. I did have a few quick questions about them, would you be able to get back to me about my questions?" CuteStat told me this, "scholaremail.org is 4 months 1 week old. It is a domain having .org extension." Thanks for your posting here as it confirms my suspicions. Thank you for adding another name to the list! THANKS for posting this info - just received an email from domain scholaremail dot org and was suspicious. Your page came up in a google search and helped me ignore it! I would like to get in touch with the person in charge of your website. I have some questions about the content. Should I address them to you? I wanted to check if you had a chance to read my previous email. I still have a question regarding your website. Is it a correct address? Glad I searched before replying. Thanks for the info! I have gotten two from Amy Creighton now..the latest "following up" to their first one as I didn't answer.lol Thanks to everyone for posting! I've received several inquiries from Pauline Brewer @scholaremail.org, along the lines of "I was on your website, and have some questions regarding the page’s content. Could you tell me if you are the correct person to contact regarding the site’s content?" Something similar came from Glenda Garcia (garciaglenda400@gmail.com): "I was doing some research a few weeks ago and I visited your site and had a question regarding the scholarship resources. If you could put me in touch with with whoever runs this page, I would greatly appreciate it. Thanks in advance!" Since there are NO scholarship resources on our webpage, I know this one is some sort of scam, too. My workplace received 3 separate but identical emails from the same person (i.e., bot). It's definitely something you should ignore. I just received a similar email from Diane Watson @scholaremail.org. Glad folks before me posted so I knew not to respond. I should have googled before i replied to the email. I received a similar one this morning from Diane Watson. Thanks for posting this thread, I just now deleted my draft of a response to diane.watson@scholaremail.org that I received today that matched the above messages word for word. I was suspicious since I received two very similar emails at the exact same time, the other being from a.roberts@uriemail.org. Keep up the great work in exposing possible scammers!